The entrance to Hotel Savoy in Mussoorie. "...and suddenly the chandelier started swaying. The windows were all shut and it was pitch dark outside." Arjun paused for breath then started as soon as he could. "The mists floating in the corridor made me feel romantic. But the chandelier jerked me out of my sweet reverie. It swayed violently, as if propelled by some force unknown. It was close to midnight and I was all alone." Bemused I drift near the group held spellbound by Arjun. "I was passing this room to fetch for Director-shaab a glass of water and was transfixed to the spot, exactly where you stand shaabji." He said pointing at me. What an ideal location to shoot our suspense telefilm! I think. It is afternoon of the next day. The room appears as if it were inside the oyster — painted all white with wooden colonnades and wooden floor bereft of any furniture — a mute witness to the fox trots, fun and gaiety of a bygone era. A huge ballroom with a lone piano in one corner stands adjacent to it. Another door opens to a corridor that leads down the stairs to the kitchen and the cellar. Glass windows rolling gently open to the outside through which occasional clouds waft in. It’s raining and as the raindrops fall on the corrugated tin roof, it make a pleasant pitter-patter sound. Supported by beams again in white, it is slanted for the snow to slope down. The chandelier hangs from it. It lay still. "But weren’t you afraid?" I ask Arjun with feigned seriousness. "No shaabji!" Pat came the reply. He was a Nepali lad and had come with us from Delhi. We had put up in Hotel Savoy, which was also the main location for the film. The scenario is chilling. According to the story, the husband buys this property from his wife’s money and they come to stay here for rest of their lives. The spouse, who is a serial killer, plans to eliminate her. But by the twists and turns of events is himself killed. The story of this hotel could as well have been the story of Mussoorie — over 150 years old and amongst the most popular hill destinations in India. Ever since the English had come to India, they sought ways and means to escape its dust and heat. After the 1815 Gurkha war, vast hill tracts of lower Himalayas fell into their hands. Captain Kennedy started the first settlements in Shimla. Captain Young pioneered Mussoorie now in Uttaranchal. 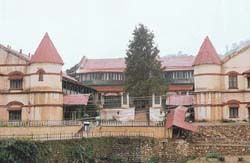 Shimla became the summer capital of British India. Mussoorie became the pleasure capital. It was in this backdrop that Lincoln acquired the estate of one Maddock’s Mussoorie School with the intention of constructing a large luxury hotel. Motorcars were yet in the realm of future. "Everything heavy, including the building materials, came uphill by bullock carts. Massive Victorian or Edwardian furniture, grand pianos, billiards tables, barrels of cider and crates of champagne — all the appurtenances of a hotel that was to become well known as the Raffles in Singapore or the Imperial in Tokyo came up in these lumbering Mr Buckle’s Bullock Cart Train," writes Ruskin Bond. The hotel was opened to the public in the summer of 1902 and was named after Savoy in London. 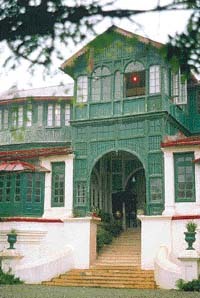 Though not much of the former glory remains but it is still the largest hill-station hotel in India in terms of acreage. And god what a character to have in this lovely place! A compelling chatterbox, short muscular built, he was a spot boy — an all-purpose fellow in his late teens. It was sometime before the next shot was to commence. So here I was whiling away my time with a real time-pass. "I was taken aback for a while, then thumped my foot and shouted, ‘Hey ghost! You move on!’ And the chandelier stopped." "As if it were waiting for your command." I say. But his face looked intent. He could not be lying. Moments later he broke the silence and added with an air of confidence. "Such incidents are very common back home in Nepal." I could only chuckle to myself. I run fast as I could. Past the ballroom, the smoking room and the billiards room. The twin wooden stairs in the hallway creaked with a flurry of activities. Someone called my name. I ignore the voice. Shoot past the main entrance. Its Victorian facade is enveloped partially by the mist. It is drizzling. A vast open space in the backdrop of majestic mountains comes before me. There are two lawn tennis grass courts with spectators’ gallery on one side. The sight of over 300-year-old two giant deodars, probably the oldest trees in Mussoorie, a little on the right, are overwhelming. A perfect picture. But my mind is elsewhere. The gravel-filled pathway makes it difficult for me to run. The path is flanked by two neat rows of double-storeyed rooms. My room is on the upper floor. As I negotiate the turn, shoes clank against the wooden floor. Frantically I search for the keys and open the door as fast as I can. The room as usual is damp. The furnishing and the furniture are old. Savoy is a bit too much steeped in its past. I toss my head looking around. And there it lay. In the far corner of the wide spring bed. It is a booklet on Savoy by Ruskin Bond. I had picked it up from the reception the other day. "Savoy had catered to virtual who’s who of its time — Her Highness Princess of Wales (later Queen Mary), Motilal Nehru, Indian Prime Ministers Jawaharlal Nehru and Indira Gandhi. His Holiness the Dalai Lama, the Emperor of Ethiopia Haile Selassie, His Majesty the King of Nepal, His Majesty the Crown Prince of Laos, Nobel Prize winner Pearl S. Buck, a host of Maharajas and many others." But this is not what I am looking for. I turn a few leaves backwards. "When Jawaharlal came to Mussoorie in 1920, he had not yet entered politics. But as a result of an incident here he was soon to find himself in the thick of freedom struggle." Some more flipping back and forth. And here it was, a paragraph above. "It is said that the halls and the corridors of the historic Savoy Hotel are haunted by the ghost of Lady Garnet Orme, who was found dead under mysterious circumstances many years ago. Apparently strychnine had been place in her medicine bottle. But how it got there no one could tell. Agatha Christie used the circumstances of the crime in her first novel The Mysterious Affairs at Styles (1920). The case was quite a sensation in its time as it involved crystal gazing and table-rapping seances. The victim was the practitioner of occult." Maybe Arjun was not imagining things! Perhaps he was not wrong. Perhaps. It further read, "A famous mind reader claimed to have found the murderer but nothing could be proved. The writer Rudyard Kipling wrote to his friend Arthur Conan Doyle, urging him to use the case, as a new adventure for Sherlock Holmes; but Holmes never made his trip to India. The case remained unsolved. In fact, it came to a dead end when Lady Garnet Orme’s doctor was also found dead (of strychnine poisoning) a few months later. But not at Savoy!" Was it the Lady’s ghost that Arjun had encountered? It is difficult to believe. But there are no grounds for disbelief either. Could he have picked up the story from the retainers? Endless mental debate...! That night as I sleep I do not bolt the door. I fervently wish the ghost would pay me a visit. The early next morning, while it is still dark all around and dense clouds blanket the mountains and the vales, I wake up to a gentle knocking on the door. As I open my eyes a strong waft of mist sweeps past me. He stood at one corner of the bed. Sleepily. His lips contorted in a naughty smile. "Chai shaabji!"